Hi Soft Pretzel. Meet my friends Chocolate Chip Cookie and Pull Apart Bread. You guys this pull apart bread recipe is yummies! It's my latest post for KitchenAid. I've been doing a series of food mashups for them lately, and I'm loving it. As you probably can guess ... for this recipe, I mashed up three of my faves: soft pretzels, chocolate chip cookies, and pull apart bread. Could you just die?! I'm so happy it turned out, and it was hubby approved too! I might never eat a different dessert/bread again. It makes a super fun idea for the holidays, and the kids will get a kick out of pulling off pieces directly from the loaf. 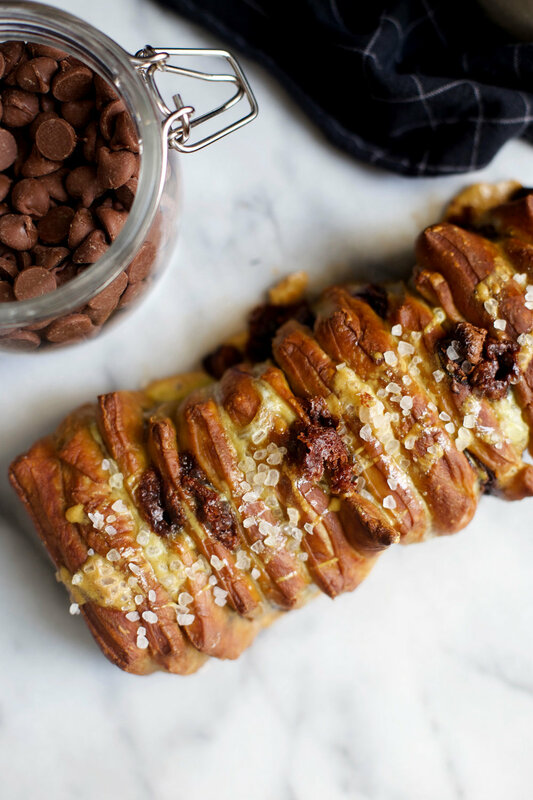 Hop on over to KitchenAid's blog, the Kitchenthusiast, for the Soft Pretzel Chocolate Chip Pull Apart Bread recipe. Look at the up close and personal shot of this pull apart bread. The soft pretzel rectangles with chocolate chips oozing out in between make me smile and hungry ... very very hungry. Must. Eat. Lunch. But I digress. You may want to get pretzel salt for this pull apart bread so it looks like authentic soft pretzels. I definitely recommend it. Don't you just want to reach right through your computer screen and pull apart those delectable little rectangles?! I sure do. In my research when coming up with this monkey bread recipe, I found some interesting things about how to make soft pretzels. Did you know the dough for soft pretzels is almost identical to sandwich bread? What makes a soft pretzel a soft pretzel is the alkaline bath you dunk it in before baking. It gelatinizes the outside of the pretzel and stops it from fully springing as sandwich bread does. It gives the soft pretzel that signature chewy crust. Traditionally the alkaline bath was done with food-grade lye. However, this is a hazardous chemical and requires special precautions when using. Luckily baking soda makes a fine substitute. So that's what we do in this pull apart monkey bread recipe ... dip the soft pretzel rectangles in the baking soda + boiling water bath before baking. I'm not going to lie, I had a bit of fun making this. This pull apart bread would be something great to pick on Christmas Day or dare I say Christmas morning. Aren't you buying chocolate chips for Santa cookies anyway? I'm always here to help. You could actually substitute the chocolate chips for white chocolate chips or cinnamon and sugar ... oh man! The cinnamon and sugar would make it an even more appropriate bread for Christmas morning. Maybe with some hot cocoa? My mind always goes to hot cocoa. Did you guys know I usually have hot cocoa every morning instead of coffee? I know ... I'm like five years old. My friends laugh at me while ordering when we go out to breakfast. I hope you guys like my Soft Pretzel Chocolate Chip Pull Apart Bread recipe! You HAVE to let me know if you make it. To help give you a visual of how it comes together, check out the video I made. I have been doing a lot more videos lately. I would love love love it if you subscribe to my YouTube channel, so you don't miss any. Don't forget to hop on over to the Kitchenthusiast for my Soft Pretzel Chocolate Chip Pull Apart Bread recipe. I don't think you will regret it. And in case you are interested, here are all of my posts for KitchenAid. Another great snack to have around the house for the holidays are my Cheesy Jalapeño Pop Tarts. They are a mashup between jalapeño poppers and pop tarts, and they are oh so good! Nov 8 A Special Video for Flynn's 1st Year!